Fall 2017 International Student Orientation this year will be July 31-August 4. Please visit International Student Life for more information and to register! The information included in the ISL orientation is not covered by any other orientation program on campus. Highlights from ISL’s orientation schedules include information concerning immigration issues, taxes for non-residents, cross-cultural adjustment, housing assistance, course registration procedures, Social Security Cards, UGA payroll, and campus tours. Current UGA students serve as orientation leaders (called World Leaders) to assist with international orientation sessions. For information about immigration and visa issuance, Immigration Services in the Office of International Education (OIE) is pleased to help you with these processes. Immigration Services’ responsibility is to The University of Georgia and to you. Immigration Services advisors are highly trained professionals who provide a welcoming and informed setting for internationals at UGA. Their office is a safe place to ask any questions you may have regarding your immigration status while in the U.S.
Congratulations again on your admission to the University of Georgia! 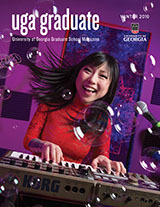 For information about immigration documents, applying for a visa, maintaining immigration status, and transferring to UGA from another U.S. institution, please visit http://international.uga.edu/issis/international-student-information. Many different types of immigration statuses are available for entry to the United States. The University of Georgia issues documents that allow you to apply for a student entry visa at a U.S. Embassy or Consulate. Student status is a non-immigrant status because students are temporarily in the U. S. for educational purposes only and are expected to return home after their studies are completed. Graduate students (new and transfer students from other U.S. institutions) will receive their immigration documents and admission letters directly from the Office of Graduate Admissions, 210 S. Jackson St., Athens, GA 30602. If you have admission questions, please contact these two offices directly, however, assistance for immigration and visa matters must be obtained in the Office of International Education after your arrival. Where should you go? The U. S. Embassy/Consulate closest to your home will process your visa application. When should you go? Most Embassies/Consulates have specific hours to review non-immigrant visa applications. Most applicants will go to the Embassy/Consulate and have to wait in long lines but there are a few that will process your application by mail. Please check with the one located closest to your home for their application procedures. Remember that the Embassy/Consulate will close for both U.S. and local holidays. Try to arrange an interview long before the day you plan to travel to the U.S. Most U. S. universities begin their academic year in August, so this is a very busy month at the Embassy/Consulate. Plan ahead so you can arrive in time for orientation and class. What should you take to the U.S. Embassy/Consulate? It is crucial that you take all the proper documents with you during your visa appointment. If you don’t, you may be required to return for a second time, which may delay your visa for several weeks. Previous school transcripts, diplomas or records (not always required but you should be prepared to present them if requested). For additional information refer to the U.S. State Department. What happens at the U.S. Embassy/Consulate? You may be required to speak with a consular official that reviews many visa applications every day. The consular officer will quickly review your documents and ask about your plans of study. The officer will verify that you have the academic ability, English language skills, and the financial resources to study at UGA. Since you are applying for a non-immigrant visa, the officer will also look for proof that you intend to return to your home country. The officer will then give you instructions about when to return to pick up your documents and your visa or when to expect them in the mail. A few applicants may receive a request to submit additional information. For more information on the visa interview, check the UGA Office of International Education. You should not enter the U.S. as a tourist using a B-l/B-2 visa or using the WT-Visa Waiver Process! You are intending to be a student, so you should not apply for a tourist visa. You may encounter immigration problems if you enter the U.S. using an inappropriate visa. Don’t worry if you already have a tourist visa in your passport, this will not prevent you from getting a student visa. You cannot attend the University of Georgia if you enter the U.S. on a tourist visa. Do not arrange to fly to the U.S. prior to getting your visa from the U.S. Embassy/Consulate. Also, remember that you cannot enter the U.S. more than 30 days before the start date listed on your I-20. If you do not have the correct immigration paperwork, you may not be allowed to board the plane. Carry your immigration documents with you onto the plane because you will be required to present your passport and these documents to the Immigration Officer at your port of entry. On the plane you will be given a form to complete called the I-94 arrival/departure record. Since you are coming to the US in the F visa category you should complete a white card. When you arrive at your port of entry, you will be inspected for admission into the U.S. At this time you will present your passport, I-20 and I-94 card, and financial information to the Immigration Officer. Your passport and I-94 will be stamped with an entry date and the departure part of the I-94 card will be stapled into your passport. The inspector will stamp your I-20 and return it to you. Put these documents in a safe place because you will need to present them to the OIE upon your arrival at The University of Georgia. Please Note: You are required by INS/BCIS to attend the institution whose Immigration documents you use to enter the U.S. The Office of Graduate Admissions will include a transfer clearance form for all individuals coming to UGA from another US institution. You will be required to have the international student advisor at your current school complete the form and forward it to the OIE PRIOR to your arrival at UGA. Failure to process your transfer to UGA within the first 15 days of the semester will be a violation of your visa status so please attend the International Student Orientation to avoid this. The student’s health insurance will provide benefits for treatment that is medically necessary for most injuries and illnesses, allowing specific exclusions and limitations, as identified in the insurance providers policy. The student’s insurance does not limit the type of coverage to treatment obtained while being hospitalized. In other words, the insurance will cover care provided by qualified, licensed medical doctors in qualified outpatient clinics or offices for covered illnesses/injuries. The maximum benefit for covered medical expenses will be at least $50,000 USD per covered accident or illness. This estimated amount excludes adjustments for deductible amounts; co-payments by insured; and usual, customary and reasonable charge limitations. The insurance coverage includes medical evacuation, as determined necessary and according to the conditions established in the policy, up to the equivalent of $10,000 USD. The insurance coverage includes repatriation of remains, as determined necessary and according to the conditions established in the policy, up to the equivalent of $7,500 USD. *If you choose this option additional forms must be completed. All new international students, including students transferring from other U.S. institutions, must attend a mandatory immigration orientation session. Please bring your passport and all INS/BCIS documents with you to this orientation. Contrary to written instructions on the form I-20, please contact the OIE once you arrive on the UGA campus. Exact dates and activities for International Student Orientation can be found through International Student Life.